A man from Johnston County took the long route to lottery success. The man has been working in construction for almost 20 years before his investments in lottery tickets finally paid off. 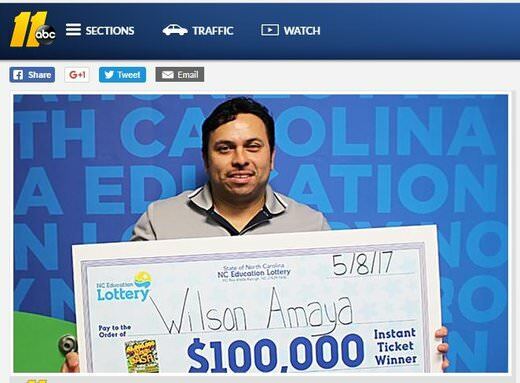 Wilson Amaya of Selma, NC won $100,000 from a Mega Cash scratch off ticket he had bought from the Market & Cafe on N.C. 96 in Selma. He and his wife were overtaken by excitement and were jumping up and down after he won. Even after the taxman took his cut, Amaya still managed to take home $69,507. So what will the lucky man do with all that money? He says he’s going to save it first with an ultimate goal of starting his own construction company. He won the first of six $100,000 prizes in the game so five more are in play. There are also three $5 million and six $1 million prizes in the game.